It’s hard to talk food when you have just spent the morning talking your child into going to school because she is worried about her safety. But I am thankful for the fact that she is safe and praying for those parents who are enduring the unimaginable. So, rather than give a post today, I’m sharing this post as we all reflect on our children and our country. 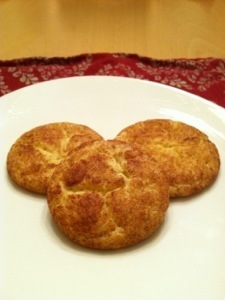 3 of our Snickerdoodles arranged in the shape of a Mickey Mouse head! If you’re going to eat a cookie, eat a homemade cookie. And eat it with cinnamon. One of my favorite cookies is the snickerdoodle. I had never even heard of snickerdoodles until I was living in Nashville and working right across from a bakery. Oh. My. I had always been a purist chocolate chip girl, but something about the combination of butter and cinnamon spoke to me. I think if Santa had a favorite cookie, this would be it. Enough spice to be interesting, but close enough to a sugar cookie to be comforting. I think the reindeer would like them, too. So, in the midst of what is turning out to be a very busy holiday season, Ellie and I took some mother/daughter time to bake cookies, and we made sure to have some snickerdoodles. In true holiday spirit, we shared them with our neighbors and friends to spread the joy. And the cinnamon. In a small bowl, combine the 1/4 c. sugar and the ground cinnamon. Set aside. In a medium mixing bowl, combine the flour, cream of tartar, nutmeg, baking soda and salt. Set aside. Add the dry ingredients to the wet ingredients and mix on low or stir to combine. Your dough will be a bit stiff. Roll scoops of dough into balls the size of a walnut (I use a mini ice cream scoop for this–works great!). Place each dough ball into the cinnamon sugar and roll around until coated. Place dough on an ungreased cookie sheet about 2″ apart. Bake 8-10 minutes, just until lightly browned. Remove from the oven and let cool 2 minutes. Using a spatula, remove cookies from cookie sheet to a cooling rack. Cool completely, if you can stand to leave them that long! I stand by the anecdotal findings of Jewish mothers everywhere that chicken soup has healing properties. 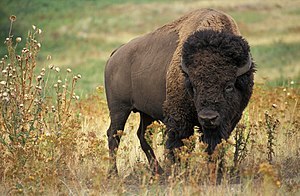 Same goes for turkey soup, but that is a little more unusual to find unless it’s shortly after Thanksgiving. There is something so satisfying about a bowl of homemade chicken/turkey noodle soup that even if you’re still sick, there is a little warm spot in your soul that feels better. I don’t get the same feeling from canned soup and I have no idea why. Maybe it’s because homemade soup, especially if you’re using homemade stock, has a richness and complexity that canned soup just doesn’t have. Or maybe it’s because when I make soup I can add as much of the good stuff (in my case turkey and noodles) as I want, so my soup is just the way I like it. Last turkey post. Promise. We used up every bit of our Thanksgiving turkey and finished up with making stock from the carcass using THIS basic recipe for chicken stock. I had to break out my canning pot to make the stock because our turkey was so large. 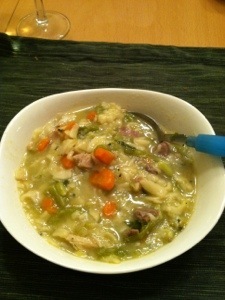 Now we have a few gallons of stock for the freezer and enough left over to make this turkey noodle soup. We’re eating a good bit of the soup this weekend and will freeze some for a day when the weather is brutal or someone is sick and we need a quick comfort fix. This recipe is entirely flexible. You can vary the ingredients to suit your taste and what happens to be fresh at your market. 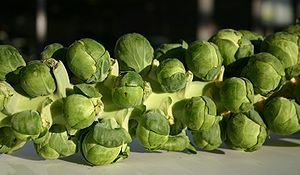 You can also cut this recipe in 1/2 or by 1/4 to suit your household size and what you feel up to cooking. In our case, we made a ton (well, 2 gallons) of soup and used up our leftover Thanksgiving vegetables plus some of the summer green beans and corn from our stash in the freezer. Totally worth it. A note about amounts. I like my soup very thick with lots of noodles and enough stock to keep everything moist. If you like a very broth-y soup, you can just cut back on some of the vegetable and noodle amounts or add more stock at the end. In a large Dutch oven, heat the stock. While stock is warming, heat olive oil in a large saute pan over medium heat. Add onions and cook about 2-3 minutes, until soft. Add the carrots and celery to the pan and continue cooking another 4-5 minutes until carrots begin to soften. Add the chopped bok choi, stir and continue to cook for another 2-3 minutes. Add cooked vegetables to the stock along with any other vegetables, herbs and seasonings. Let simmer for about 10 minutes. Add turkey/chicken and continue simmering for another 15 minutes or so. Add noodles and simmer until noodles are done. They will swell up and absorb a good deal of the stock. If you need more stock, add water or (if you have it) more poultry stock to suit your taste. Remove the bay leaves and any other large pieces of herbs you may have in the pot. Serve immediately or cool and refrigerate to reheat the next day (this is always better).